FEATURES: 5/16" Round Flat Head, 9 Gauge Shank, Diamond point, round barbed shank. APPLICATIONS: For attaching joist hangers to wood studs. 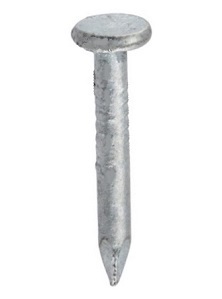 Short, heavy gauge nail provides increased holding power without fully penetrating wood. Joist Hanging, etc. For attaching joist hangers and metal connectors to wood studs. Short, heavy gauge nail provides increased holding power without fully penetrating wood. Structurally rated. Hot dipped galvanized finish for superior corrosion resistance.